No sense in hiding it: I'm really impressed with myself right now. I want to give me a pat on the back. 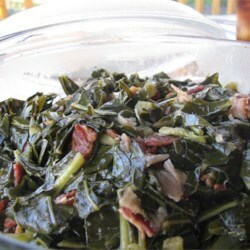 But most of all, I want to go in there and eat that whole pot of collard greens I just made. All thanks to this recipe! Somehow, born and raised in Georgia....this is my first time making collard greens. Didn't like them for a long time, but I'm coming around now. And WOW are these good. In addition to upping the (reduced sodium) bacon to 8 strips, I added a little more salt, a heaping tablespoon of brown sugar, and probably two tablespoons of apple cider vinegar per reviews. That totally pushed these over the edge for me. I could hardly give them the 45 minute minimum to simmer....once I did a taste test, it was all over. In summary: MAKE. THESE. COLLARD GREENS.